CAPE CANAVERAL AIR FORCE STATION, Fla., Oct. 2, 2015 (ULA PR) –United Launch Alliance (ULA) successfully launched its 100th mission today with an Atlas V rocket carrying the Morelos-3 satellite for Mexico’s Ministry of Communications and Transportation. The mission, procured for Mexico by Lockheed Martin Commercial Launch Services, launched at 6:28 a.m. EDT from Space Launch Complex-41. The Morelos-3 launch was accelerated to an earlier position on the Atlas launch manifest. The acceleration was accommodated by an agreement with the U.S. Air Force. 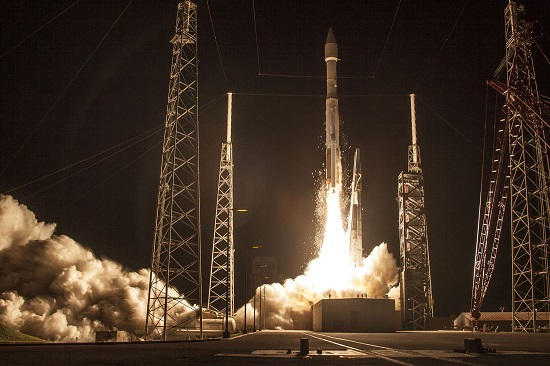 The agreement allowed the MEXSAT customer to launch atop an Atlas V rocket utilizing a launch slot that was previously manifested for a Global Positioning System satellite. This change demonstrates ULA’s ability to meet the needs of commercial customers and the Air Force’s willingness to accommodate real-time needs of other satellite programs. This mission was launched aboard an Atlas V 421 configuration vehicle, which includes a 4-meter diameter payload fairing and two Aerojet Rocketdyne solid rocket motors attached to the Atlas booster. The Atlas booster for this mission was powered by the RD AMROSS RD-180 engine and the Centaur upper stage was powered by the Aerojet Rocketdyne RL10C-1 engine. This was the 57th Atlas V launch since the vehicle’s inaugural mission in 2002 and the fifth in the 421 configuration. Morelos-3 is part of the Mexsat constellation of satellites, which provide secure communications for Mexico’s national security needs and communications to rural zones to complement other existing networks. The Mexsat program is an end-to-end satellite communications system that provides 3G+ communications services to mobile terminals across multiple platforms. These services include education and health programs, voice, data, video and internet. ULA’s next launch is an Atlas V rocket carrying a payload for the National Reconnaissance Office (NRO), scheduled for Oct. 8 from Space Launch Complex-3 at Vandenberg Air Force Base, Calif.
With more than a century of combined heritage, United Launch Alliance is the nation’s most experienced and reliable launch service provider. ULA has successfully delivered 100 satellites to orbit that provide critical capabilities for troops in the field, aid meteorologists in tracking severe weather, enable personal device-based GPS navigation and unlock the mysteries of our solar system. Expensive but undeniably top class. As the French or Swiss might say: Haute Fuseologie. Professional, highly subsidized rocket launching company. Now, thanks to competition, ULA is finally looking at ways to significantly reduce the price of Atlas V launches. Competition is a good thing.